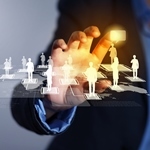 differencemakers community blog: Are You Ready for a More Fluid Workforce? The workplace has changed: in space, in time, and even in the people who do the work. For most of the past 200 years, the workplace of the office worker has been ... well, an office. It still is. It was the only practical option: That’s where teams could meet, that’s where the files were stored, that’s where the typing pool was, that’s where people put stuff in your (physical!) inbox. You could use the phone to reach people remotely, but that was either quick (for getting a quick answer), temporary (colleague away from the office), or to arrange a meeting. Wasted time: the daily commute, meetings, interruptions, people getting sick during the flu season, etc. Expenses: fixed costs of running an office, variable costs, IT infrastructure, software upgrades, etc. Hierarchy and rigid rules: tendency to impose top-down control, being insular, rejecting outsides, etc. Most of all, it just wasn’t tapping into the potential offered by the Internet and Cloud. Now we have many more distributed teams, where some people work from home, others work from other offices around the world, and others work from cafes or shared working spaces. Distributed teams and the virtual workplace reduced some of the friction of the physical office, and improved productivity. But, although it fixes the problem of when and where people work, it doesn’t address the issue of who does the work. What are the chances that the people you employed – possibly many years ago – just happen to be the best people in the world for your key project right now? In the past, it wasn’t practical to use anybody else, but now you (literally!) have the whole world at your fingertips. Your future workforce is not defined by its workplace. A team comes together - from anywhere in the world - for a task, does the work, and then disperses. Sometimes the entire team disbands, sometimes the core remains. But the key is that you’re getting the best people for the job. Some organisations are better than others in adapting to this future. Most aren't ready for it, and some will actively resist it (and may never get there). But if you really want to prepare your organisation for the fast-changing world of work, at least consider how you can create a more fluid work environment. Team Members: Are your current teams really the best people to complete your current projects and meet your goals? Did you really choose the best people, or just make the best you could of the people you have? Performance: Are you measuring and rewarding people for results achieved (rather than time spent)? Supervision: Can your people really work independently, and simply report back at agreed touchpoints (rather than having to follow prescribed systems, processes and rules)? Interdependence: Do team members accommodate each other's needs, even outside scheduled meetings and events? Although I've framed these as simple Yes/No questions, the answers generally won't be as simple. Rate your teams on a scale of 0 to 10 for each of these four questions, and that will give you a good idea of how well you'll be ready to build the fluid workforce of the future.